Make the nether beetles, both skins for them, nightcrawlers and worms mobs/entitys, this be more fun and cool. Oh ok. But I still think that entities could be coded to be attracted to the fishing_bobber. Yeah the "fishing block" was never how it would actually work, just to help describe the system. Having it coded to the position of the fishing bobber is probably the best way to go. Would it be like silverfish, where they come out of blocks after they are destroyed? That is a intriguing idea, but I think it would just cause more annoyance than good. I'll have to think about it more. Since we now have fish mobs in the Update Aquatic, this suggestion is slowly becoming a reality, if only partway. Who knows, they may add bait to make fishing a tiny bit easier. I agree with the main part of your suggestion: new fishing mechanics. I also like the idea of baits, but not exactly as suggested. My first issue is that increasing bobbing's effective range shortly becomes pointless, since just pointing somewhere else to fish after a fish is caught would probably be even more effective. My second issue is that bread crumbs would be much easier to obtain than worms. Yes, shovelling dirt is easy, but making bread is even easier if one has a massive semi-automatic wheat farm (as one does), so worms as bait would be pointless anyway. Both issues can be easily solved, though. How about if their range were same, but one were more suitable for catching fish faster, and the other for catching rarer fish? Now, Nether and Phantom baits make no sense to me. Nether is like some sort of hell, hence the lava, ghasts and soulsand. It shouldn't have anything organic thriving in it. You could instead be able to use some shiny inorganic Nether item like blaze rods or Nether crystals to craft an inorganic bait like a spoon lure. They could have similar stats to worms or bread crumbs but being inorganic, would last much, much longer. Phantoms are mobs designed to keep players from sleeplessness, but they also drop potion ingredients, which encourages players not to sleep, so I guess it's complicated... Point is, they're undead floating mantas, literally called phantoms, it feels really weird to have them drop something fish eat. I also dislike the idea that baits can be so rare (or even non-renewable if they were to spawn in End City chests) that you'd have to wait three days every time just to get a handful of them. Perhaps a fourth hard-to-get bait type could be crafted using some of these Wolftopia's ideas. Even if I don't entirely agree with his proposal, he's got some really nice Ocean creature concepts that might tie very nicely with fishing. Finally, I also don't believe this new fishing mechanics and 5s "cooldown" would be very effective to discourage AFK fish farms because treasure fishing is much more useful and used than "regular fish fishing" anyway. It could be more effective to force players to catch fish every once in a while before getting another treasure. That is, after a treasure is caught, one must catch at least a couple of fish before being able to catch another treasure again. 1. Each time you change the bobber, the fishing rod loses durability. This, combined with perhaps a slower bobber animation, would help encourage more realistic fishing (put the bobber in and wait for a while). While I see your point about increasing the chances, I didn't want to interfere with fishing enchantments. Fish mobs move around quick, so it would be very beneficial to have an increased range. Now that I'm thinking about it, what if the chances of a fish coming increased the longer the rod was in the water? 2. Bread crumbs are the only bait that come at a cost. Worms are obtained alongside dirt, same for beetles. You lose bread when crafting crumbs, so in early game it would be smarter to use all that dirt instead. Once you get a fully automated wheat farm, you can switch to crumbs- but you are still losing something from crumbs. 3. Nether beetles are bugs, which fish typically like. How they survive in hell... I don't know, but beetles can imply scary things (mummies). The main reasoning for having them in the nether is to create somewhat of a progression, because someone shouldn't be able to stumble upon the best bait so quick. I imagine nightstalkers(crawlers) as a parasite that lives inside monsters, such as the phantom. 4. Wolftopia mainly describer mobs in that section... which items are you referring to. Fish mainly take bugs as bait, I do not see any bugs there. 5. I still think AFK fishing farms would be killed by the 5 second rule, but yes let's keep the slaughter going. I'll add this to the OP. You make some good points. I had not really taken durability into account because fishing rods are rather cheap, but failed to consider their enchantment costs. I still think my point stands for early game fishing with worms and bread crumbs, though. I also agree with you on your non-interference with fishing enchantments stance. More creative solutions like different fish preferring different baits have been suggested previously in this thread. As for your question, I don't know, right now I don't think so, but I also think bobber's effect should have a good enough range even for worms and bread crumbs. I still think bread crumbs are much easier to come by, but even then, isn't it better if the two easier to gather baits have different purposes instead of one merely being better than the other? 3. [...] The main reasoning for having them in the nether is to create somewhat of a progression, because someone shouldn't be able to stumble upon the best bait so quick. I imagine nightstalkers(crawlers) as a parasite that lives inside monsters, such as the phantom. "You could instead be able to use some shiny inorganic Nether item like blaze rods or Nether quartz to craft an inorganic bait like a spoon lure." As for night[stalkers/crawlers], I still disagree. Phantoms are much more on the ethereal edge of undead than on the rotting edge. But I was referring to mobs. Some of his suggested mobs, like anemone, could be made into bait (or at least part of a bait recipe) as well. Thanks! The gameplay reasoning behind my suggestion is to completely undermine compact fish farms, as no fish would spawn in those tiny areas. The roleplay reasoning is that treasures should be at least somewhat scarce enough that fishing actual fish is more common. I think it makes sense. I always felt fishing had potential to be more interesting and this idea improves it greatly. The new tiers of bait are awesome and it'd be cool to have a fishing shack and a dock on a pond with your chest of bait and your fishing pole. Interesting. Not gonna lie I do love how op and easy afk fishing is. But that brings up a good point. It says alot about the mechanic if players only use it to farm resources and nothing more. I'd like to see something like this make its way into the game. Though I would like Mojang to revisit items currently in the game and give them more use, such as beetroot seeds, rather than develop new items and blocks. Indeed, beetroot could use a use. Now that the poll is tied with a majority preferring a combination, I'll try to combine the new baits and the old seeds into a stronger, united bait progression. I understand that you'd enjoy a broken system like AFK fishing. In the moment, a broken system is awesome. You've outsmarted the game for your own benefit and are now moar powerful than anyone else. But when you keep playing and see the system being abused again and again, you begin to see things on a bigger scale. Minecraft is a game of many interwoven components, and by keeping fishing in its broken state the game will only suffer. I think everyone here can agree, albeit reluctantly, that Minecraft would benefit more with a working fishing system rather than a broken one. I support I love fishing irl in minecraft i would be a cool taste of reality you have my approval . Agreed. My statement was a reflection of honesty. I don't mind abusing mechanics such as this, but you also make a valid point that it does get old and some fun is lost. For example, I started a 1.13pre-x world to familiarize myself with the new features. An afk fish farm gave me all the loot I needed to get a pretty beastly pic and armor and weapons, which led me to take down the wither and get my first beacon within 3 irl days of play time. So a balance would be ideal. We are spanking the Underwater Breathing potions pretty hard, and my wife suggested we set up an AFK fishing farm. She primarily does the fishing. I suggested we wait until LiteLoader and the Auto Fisher catch up. We tried building redstone AFK fishers, but they were so much a pain to deal with. We could also invoke the auto script, but she would forget, start using her computer, get confused, then things would go downhill rapidly. Fishing is the activity of catching fish, either for food or as a sport. Finding treasure is a byproduct of fishing. I don't think the byproduct should be talked about more often than the actual fish, which is why its called fishing in the first place. And are perfect enchants really balanced? Isn't the entire point of the enchanting table having cryptic runes so that you don't know what you're getting? place. And are perfect enchants really balanced? Isn't the entire point of the enchanting table having cryptic runes so that you don't know what you're getting? I have to disagree with you on this. Fishing is the most efficient way of getting Frost Walker, Mending, and any other treasure enchantments in the future. Also, if you have an anvil, you can get amazing enchantments on your gear through fishing. I've done it before. And, instead of draining players of xp like the enchantment table does, it actually gives players a small amount of xp. Most of the awesome enchantments I've gotten in most of my worlds were from fishing. Yup! And I do like some of the ideas. The "bait" suggestion may be a good one, a use for all those "WAY TO MANY FREAKIN' SEEDS" and so on. 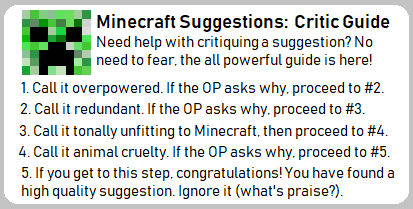 mcMMO tries to make various tasks reward for doing them "straight/ not-as-an-auto-farm". It even tries to do this with fishing, but if one is clever (and uses the LiteLoader auto-afk fisher), their anti-afk is easily enough defeated... I just won't explain how *here*. And as I've stated before on my server, I don't care if you AFK, I care if you are enjoying your time on my server, and don't lag my server. Anyway, I love the suggestions on changing the design of fishing so it isn't SO mind-numbing BOOORRRRINGGGGGG that you are faced with the decision of "AFK fishing or feel your brain rot." There must be a better way of handling this. Apologies if you've already added this to the thread, but have you thought about making treasure per-chunk? The world could store the amount of treasure that is in each chunk (this would be based off of the seed) once you start fishing in said chunk. When it runs out, you'll have to find a different place to fish for treasure. The only chunks that regenerate their treasure amount are chunks that are in ocean biomes, but it takes a very long time to do so. I propose a different arrangement of baits: seeds, bread crumbs, kelp, silverfish tails (dropped from silverfish) and an item only purchaseable from Fishermen. I think fishing is not boring because you never know whats next: "Am I going to get a bow with mending? Or kill an innocent fish which is useless because I am Vegitarian?" And than when you are Vegitarian you don't have "WAY TO MANY FREAKIN' SEEDS"